Zwernitz, originally the hereditary seat of the Walpodes of Upper Franconia, is located in an area used for centuries by the local rulers for hunting. The keep and the tithe barn made of rusticated ashlars are part of the original Romanesque complex built in 1200. In 1338 the castle came into the possession of the Hohenzollern family. 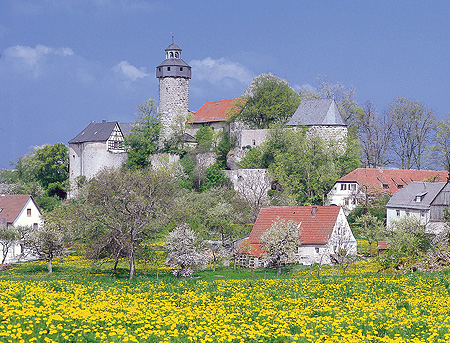 Around two centuries later the half-timbered buildings of the lower castle were added. When the rock garden was laid out, it was designed to incorporate a view of the castle located on a natural elevation above it. From the keep there is a magnificent panoramic view of the Franconian Switzerland Natural Park. An interesting exhibition in the castle complex documents the history of Zwernitz Castle, its inhabitants, and Sanspareil. It provides information for example about the role of the rock garden, for which the castle served as a backdrop from 1745 on. The castle’s function as part of the margravial "watch system" is also described: this progressive early warning system enabled messages to be communicated swiftly over long distances day and night. The permanent exhibition "Hunting in the time of the margraves" documents hunting as pursued by the court in the two margraviates of Ansbach and Bayreuth at the height of its popularity in the 18th century. For all the courts of the Baroque age, hunting was an important aspect of princely representation. Almost all the margraves from the House of Hohenzollern were enthusiastic hunters. Since in the Holy Roman Empire of the German Nation the local rulers were granted the imperial right to hunt deer, bears and wild boar, practically their whole territory was a princely hunting ground. Hunting lodges thus had to be maintained throughout the country, some of which were proper palaces, a vast army of hunting personnel was retained and a large supply of hunting equipment was kept in each place. With impressive exhibits and informative descriptions a fascinating picture is created of court hunting in a world long since past.